Dennis Bergkamp came on to score one and create one as Arsenal stepped up their challenge for fourth spot and dent West Brom's survival hopes. 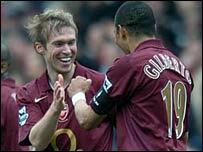 The home side looked to be heading for a comfortable victory after Alexander Hleb's skill and power put them ahead. Skipper Nigel Quashie capitalised on an Emmanuel Eboue mistake to give the visitors hope after 72 minutes. But Bergkamp set up Pires to put the Gunners ahead and then sealed the win with a delightful curling shot. The stadium was awash with orange as the home fans donned the colour of Bergkamp's native Holland to pay tribute to the Dutchman's 11-year spell at Highbury. And with Bergkamp looking on from the bench, the Arsenal line-up was in need of his creativity in the first half. The quiet start favoured West Brom as the visitors set about frustrating the Arsenal attack and even posed problems for the hosts. What a fitting tribute for Bergkamp to score on Dennis Bergkamp Day - one of the greatest footballers ever! Quashie saw a speculative long-range drive drift wide of the upright, while Neil Clement slashed a free-kick over. Thierry Henry missed Arsenal's best chance of the half when he pushed his shot wide of the post when clean through on goal. The Baggies defence looked to be heading into the break level, but Hleb powered Arsenal ahead just before the interval. The Belarus international charged into the box, exchanged a neat one-two with Henry and drilled a left-foot shot into the roof of the net. Arsenal started the second half with the same zest that they finished the first with and the superb Curtis Davies twice kept Henry at bay. But clear chances were kept to a premium and for all their possession, Arsenal struggled to test Tomasz Kuszczak. With Wednesday's Champions League semi-final in mind, boss Arsene Wenger withdrew Henry with Emmanuel Adebayor replacing the Frenchman. The loudest cheer of the afternoon was saved for Bergkamp's introduction midway through the second half as the Gunners looked to kill off the match. But with Arsenal minds on the substitutions, West Brom countered and caught the Gunners defence sleeping and drew level. Quashie capitalised on Eboue's error and neatly fired home from the edge of the area on 72 minutes. West Brom had a decent shout for a penalty turned down 10 minutes from time as Davies went down after Eboue looked to have clipped the centre back. Arsenal responded four minutes later when the two substitutes Pires and Bergkamp combined and the Frenchman poked home past two defenders. But the day was to belong to Bergkamp who sealed the win with a trademark curling shot at the end. "He never loses the class and after 10 fantastic years he proves that he can still play. "It would have been sad not to have brought him on and I felt we were looking for his quality to create the opportunities we needed at the end. "We showed a great reaction at 1-1 and I'm pleased with the chances we made." "I'm disappointed because we started to play some decent football in the second half but the players simply got too excitable at 1-1. "That was the main reason we lost because when we started to attack and go forward we left holes for Arsenal. "It was a good opportunity to pick up an invaluable point after pulling back to 1-1 but we got too excited." Arsenal: Lehmann, Eboue, Toure, Senderos, Flamini, Hleb (Pires 71), Silva, Diaby, Reyes, Henry (Adebayor 62), Van Persie (Bergkamp 72). Subs Not Used: Poom, Djourou. Goals: Hleb 44, Pires 76, Bergkamp 89. West Brom: Kuszczak, Albrechtsen, Curtis Davies, Clement, Robinson, Greening, Wallwork (Carter 79), Quashie, Gera (Inamoto 63), Kamara, Kanu (Campbell 59). Subs Not Used: Hoult, Watson.